A simple paper clad parol. Classic, seasonal, restrained and beautiful. Absolutely my favorite seasonal decor item at this time of the year. So pinoy, so evocative of a simpler time, so devoid of inappropriate jazz. They are almost IMPOSSIBLE to find, a decorative dinosaur in today’s in-your-face landscape of lights, razzle dazzle and all kinds of made-in-China tinsel and glitz. 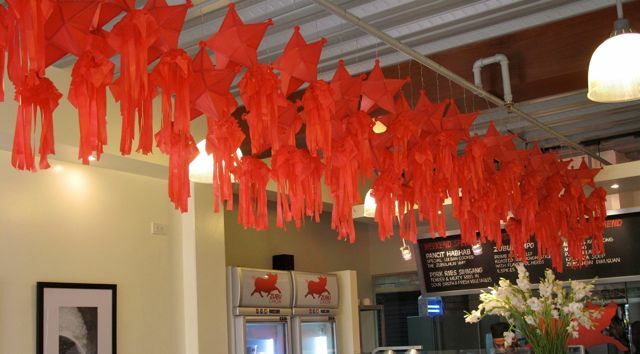 So when we wracked our brains for appropriate holiday decor for our restaurants, of course I/we opted for classic red parols made with papel de japon. But where to obtain 200 of them when the markets were only teaming with garrish, plastic clad versions, admittedly practical (can last several years) but oh so wrong?? Not 10 minutes after concluding the decision to get paper parols, we drove by an older gentleman selling plastic parols outside a church and I stopped the car and asked him if he would make us some paper parols. He looked surprised at the request, but said he could do it, so I ordered 200, much to his shock, surprise and ultimately financial delight! Back at home, without the benefit of this serendipitous find, we had already made two dozen white parols from scratch, and they hang happily outside our front door. I read somewhere that the farol/parol was once used as a “guiding light” for provincial folks who had risen before dawn and walked in groups towards the nearest town church or chapel. I suppose the lanterns must have been powered by candles, thus probably went up in flames relatively frequently! For me, the romantic vision of pitch dark or deep, deep pre-dawn blue countryside scenes dotted with slowly moving candle-lit parols leading folks to early morning mass is something I wish I could see today… or at least in a well made local holiday movie. Have been to two markets in search of the authentic parol (papel de japon) but no success. Pls share your source. Many many thanks. and dinuguan and enjoyed every bite. I was pleasantly surprised on how good the kamias shake was and of course I just had to order the leche flan to finish the meal and it was perfect, not too sweet. I had another surprise when I got to my hotel room and looked at my Zubuchon receipt, thanks Marketman. I have one more week to spend here in Cebu so I will be eating at Zubuchon a few more times. Yes MM, I too am sick of the garrish christmas overdecoration	and many times inappropriate especially in small places. The nice simple red parols offer visual relief and is evocative of a more spiritual Christmas. Can’t wait to see those papel de japon parols (and of course binge on zubuchon goodies) in 9 days!!! welcome back MM. hope you feel better soon. This post reminds me of an NGO’s campaign a long time ago where they sold similar parols for the benefit of the starving children in the sugarlands of Negros. 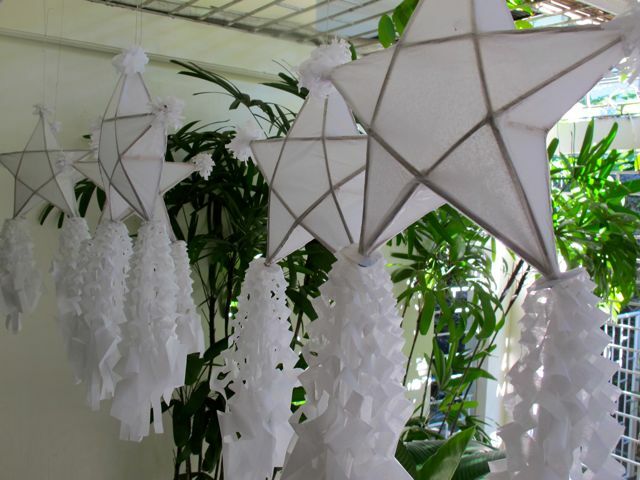 It was a hit and the parols became the must-have decor that year even in the poshier places in Metro Manila. But now they’ve really become hard to find. Last year, we could not find a single stall at Dapitan Arcade that sold them. I’ll take your tip and check out Nepa-Q this weekend. titabuds: that’s the quintessential pinoy christmas album for me, we grew up listening to it in the ’80s. may kopya pa kaya nun sa sm or odyssey or astroplus? Years ago when I was much younger, I attempted to start a program to teach young people how to make traditional parols. I felt fortunate to have been “apprenticed” in the old ways of manufacturing these–from splitting your own bamboo stalks and shaving them into the right size, tying with the right knotting techniques to string the sticks into a symmetrical frame, down to cooking your own paste from gawgaw. It was truly heartbreaking to realize down the road that these kids no longer had it in them to carry on such a humble but profoundly substantial tradition. There is something sublime and spiritual about the spartan bamboo-and-paper parol. But I guess, ultimately, that had to bow down to the bongga factor of the spectacular plastic-and-wire lanterns with dancing lights. I’m beginning to feel like a dinosaur. Huhuhu…. I too would order paper parols for Christmas, mostly white ones with tails with cut-out designs that make them look like giant pastillas wrappers from San Miguel, Bulacan. They bring back memories of simpler, and maybe more gracious, times for me. They also remind me of how Mary The Queen in Greenhills would deck the porches on either side of the church with white paper parols, hung from the ceiling, neatly spaced from each other, tails fluttering in the cooler breezes of December. There is the Samahang Magpaparol in Las Piñas that can be approached, and another man besides, who stations himself near the Las Piñas Church and who can be commissioned to make paper parols, big and small. I wish the paper parol of yore would grace homes again during Christmas in the Philippines. Pag hindi ko ito project kada pasko sa school noon, parang hindi pasko. It has to be papel de hapon, not plastic. My other project is the saranggola. MM..What a coincidence!! My daughter who just moved to Las Vegas , called , she found little parols, she want to keep the shells and redo the plastic . Her question is MM ..is there a substitute of papel de Hapon? it is the same as Origami paper ? These posting make want to fly and spend Christmas home!! Beautiful. Missed your posts. MM. I must say, the lovely, simple, festive farols at your house and Zubuchon’s in Cebu beat photo you posted of the Tiffany display on NYC’s Fifth Avenue by – a wide wide mile!! To answer Sleepless in Seattle, as I kid we also used cellophane to cover the parols. In the US a good substitute for papel de hapon is colored “tissue” paper (not toilet or kleenex) sold at Costco or paper party stores in sheet bundles. Available in dozens of colors from packaging stores online as well. There is no more true cellophane available, the last manufacturer in the world went out of business a few years ago. What looks like cellophane is now acrylic but a good substitute but does not hold it’s shape when twisted to wrap sweets. Both good for parols. Oh my, two more weeks then my daughter and I are flying in from US to Cebu ( not our final destination) to get a taste of Zubuchon. Been waiting for this since resto opened. Can’t wait to see the place with all the classic parols and taste the food!! Merry Christmas Marketman. Glad you’re back. Thanks Lou & Sister.. I appreciate the info…will let my daughter know..to get to Party stores or Costco.I remember true cellophane,were pretty with parol too!! They were use for homemade candy wrapping,nowadays i just use wax paper for homemade Salted caramel candies. #13, Sleepless, try http://www.michaels.com they should carry the tissue wrapping paper there in different colors. Last time that my uncle was here, he bought parol bamboo stars somewhere near the St Joseph’s Church (which houses the Bamboo Organ) in Las Pinas to take back to the US. Thanks Ted!! My daughter shops a lot on line	..there should be a Michaels close to her home. oh, wow…just yesterday i was lamenting over the fact that ncobody seems to be making parols out of papel de japon anymore. i know the plastic ones are more durable and recyclable, but i think the old ones are more elegant. japanese paper lanterns … i can’t wait to see your photos of them! I think the CELLOPHANE we now use in gift wrapping food gifts is very much the same as the one we used in wrapping our parols ages ago. They are still very much available at National Bookstores. 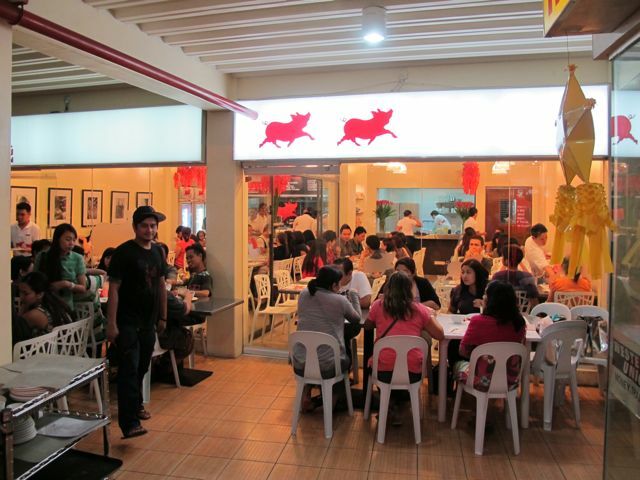 glad you are back MM…would go back to Zubuchon again during our Christmas vacation in Cebu. my parents’ place in Cebu is never without a parol during Christmas albeit made of plastic not papel de japon. the hubby boasts of making the best parol in his elementary school years, would ask him to pass this know-how to our kids lest this tradition die down also with the ever changing and modern times! Merry Christmas, MM and family. I just put up my parols though not made of papel de japon. Bought them in dumaguete in 2003 and still going strong. I always relate the parols with Christmas. And yes, I also have the lighted star hanging on the window. I was wondering what happened to you. Hope you feel better now. Made it to Manhattan post Thanksgiving and enjoyed 5th Ave dept stores christmas decors. Missed Tiffany though. Anugon. Something to look forward to for another time. These look pretty! We’re headed off for a quick trip to Cebu this weekend with the babies and I told hubs that Zubuchon is a must in our itenerary :) Can’t wait! Sleepless in Seattle, tissue paper is also easily found in Target, Walmart, and other grocery and drugstores. Just go to the gift wrapping section. They are often used for lining gift bags. Also, for anyone wanting to make their own mini parols from scratch, bamboo skewers (used for barbecuing), work well to form the frame. To make the paste, boil some water. If you have any tawas, you may add a small amount to the boiling water as a preservative. Make a thick slurry of water and cornstarch (gawgaw). Sticky rice flour may also be used in lieu of cornstarch. Make sure the cornstarch is completely dissolved in the water. Add this slurry to the boiling water and stir until thick. The thickening process is very quick, almost instantaneous. Unless a preservative like tawas is used, this paste goes bad fast. Refrigeration also helps extend its life. I made a tissue paper covered, bamboo skewer star that I use as a tree topper 18(!) years ago and I still use it every year. It still looks good with only a little scratch in one spot. So, for those thinking that it’s not worth making a traditional parol with papel de japon/tissue paper, know that it can last years with a little care. the store has expanded? Congratulations, everyone! I see pancit habhab & pork ribs sinigang on the board. And are those “azucena” flowers in the vase? MM, the store looks lovely. I was thrilled to see your extension..I love that business is good for your troops. The man that made the paper parols for my lola still makes them for me every year. He is in Guadalupe, not far from you. I send him my bamboo forms every year; I buy the paper from Visayan Educational Supply and he fixes my parols. Two years ago, I had him make the mini ones, about 500 of them, and sold them for him at the Cebu International School bazaar. The response was overwhelming…people kept saying how they hadn’t seen them for years! Incredible that the art is lost for most…Christmas without paper parols is a sad one for me. Bennym..she found them at Michaels ..per Ted!! Thanks B. I did not know that they are like.. the ordinary tissue to stuff gift bags .Love ..Love ..Love..MM and you guys!! Thanks for the info!!! my daughter can have Parols she remember when she was 9.I went home in2009 Christmas our home, is decorated lavishly western style,Christmas tree & all	by my Nieces.I wont make it this Christmas but will go home in May.Hopefully we can plan on 2012 Yuletide..i can give a hint.. i want a traditional Christmas. Can somebody please post instructions on how to make the parol cutout tail? We never seem to get that right when we try making it. Thanks. Love the parols, so Pinoy. Congrats on the store’s extension MM. Merry Christmas to ur family and crew and to all the readers! Such an appropriate and relevant post. Not only is the parol so Pinoy. If I’m not mistaken, Uniquely Pinoy – only in the Philippines is the Christmas Star so emphasized. Indeed, how fitting that you had them made in their simplest and most beautiful. Papa Ethan, can I study doing the parol under you?! I’m serious. That is, if you are Manila-based. Even next year, since this month is already too hectic. We’re making now from scratch but we don’t have even a vague idea what the thickness of the bamboo should be, let alone the other details! Ah, the papel de japon parol. It’s part of my childhood Christmas experience. We have a shell from way back 20+ years. Every year, my dad and us kids would tear off last years’s paper and then redo the huge thing with fresh paper. It was almost 4 feet tall. Dad has been an OFW for the past 7 years, and so it has been 7 years since we have had a papel de japon parol. I feel like a dinosaur too! Zubuchon in Manila for Christmas please. Dear MM, I’ve been good. How was the Christmas party? Waiting for the pictures…I am sure everybody had fun. To you MM , Mrs. MM and the Teen and Sister and Betty Q. Merry Christmas and a Happy and Prosperous New Year. nothing beats the papel de japon parol for bringing on the nostalgia of Christmases past. :) how lucky you found someone who could make them for you, though the white ones look equally pretty. Gee, MM, it’s amazing how your blog fosters discussions about things other than food! Those bare, single-colored parols of yours are truly breathtaking in their simplicity, and yet look at the powerful responses (emotional and intellectual) that they have triggered. Kudos! Marketfan: i wished i had the time to draw a step-by-step guide on how to cut the “saya” of the parol tail. The procedure is actually so simple but the result is incredible! It would amaze you what genius lies behind it. Gej: yes, I’m Manila-based. I would gladly teach anyone who is interested. Let’s figure out a way soon to embark on this project. Papa Ethan – Wow! my e-mail add is kitchenherbs@gmail.com . Please send me a message, and let’s arrange. Why wait till next year?! Game! Papa Ethan, Kasseopeia. Dinosaurs are great. Remember the saying : Dinosaurs are a girl’s best friend. ? Ha ha! Just an absurd joke. Seriously now, Kasseopeia, my Dad was once an OFW (known more as OCW during that time). I still remember how incomplete our Christmases were without Papa, and realize how much worse it was for him. Thanks for the reminder to appreciate his presence. Technology has probably made it easier now to be “together” while apart, but it’s just not the same. Specially with no papel de japon parol. My mom used to make Christmas tree out of walis ting-ting, papel de japon and banana plant. She folds those papel de japon and cuts/slits them into grass like hairs and winds them to the ting ting from top to bottom and plugs them into the banana plant, walla white or green xmas tree. It’s not Christmas without it in our home. That was 30-35 yrs ago. We also make our own parols from scratch. Marketfan: To make the tail or saya of the parol, you just fold the paper into half, lenghtwise, then fold them again from its width, then fold into triangle like making paper plane, making sure the center of the paper is also it’s tip, then start making alternate slit cuts on the side of the paper to the middle, about half an inch separation, unfold, make a round from a cardboard about 4-5 inch in diameter and paste it at the center of the paper. oh, dear! i hope you’re feeling better. if not, get better soon. nothing worse than getting sick during the holidays. no worries about the lack of postings. with all the craziness and hectic scheds – i’m sure we all understand. try to get some extra rest, if you could. the parols look so pretty! Papel de hapon…also available at DOLLAR STORES! For a tutorial on parol making….YOU TUBE!!!! For paste…use a glue gun! Hi Betty Q! Happy Holidays! I’ve been waiting for you to pop in one of the newer threads of MM. This is off-topic, truly sorry. I wanted to ask if you could email me a copy of your Chocolate Cake recipe.. The one posted in the old threads, you mentioned, is not your “pride and joy” recipe. I was hoping to bake it for Christmas. Please do share, if you aren’t too busy with the Christmas rush. I also wanted paper parol for this year but since I thought it was already extinct, I had to make do with the lighted lantern from san fernando, pampanga (it has its own charm). I remember growing up in Cagayan during the late 70’s and early 80’s, the prisoners from the town’s bilibid would sell beautiful parols! What made the parols even more beautiful were the belen cutouts (from old Christmas cards) pasted in the middle of the parol. These parols bring back so many fond memories of my childhood. I prefer these lanterns than the ones that are being sold now that are made of plastic. These lanterns though very simple exude sophistication. Hi Bettyq, I was just waiting for someone to direct me to an instructional video. Thanks. Ha, ha, glue gun is right. Did not think of that. Merry Christmas to you and your family. How was the getogether last Dec 3rd. Hope I can make it to the next one. hint, hint. LJC restaurants also have them, and we are having some made as well. I asked LJC last year, and they said the staff actually gets together and makes them. Fantastic. My parol always sucked in grade school, I wish I could make even a simple one, but I guess it takes practice! Even the Christmas lights these days look really strange. Christmas now feels like one giant acid trip. I hope there is a vendor of papel de japon parol in Manila. Been looking for one. cut and paste the links into your browser or google them. MM: thanks talaga for being the catalyst of this discourse. Judging by the erudite comments that have so far been posted, it is truly heart-warming to now realize that the traditional Filipino parol still retains its respect in the memory of many. Compared to the Spanish farol or farola (which is a generic term for the utilitarian lantern or night-lamp), our parol is a distinct and tangible icon of the Filipino psyche’s acceptance of the Catholic concept of the story of Redemption. The parol is our material expression for the Star of Bethlehem. Thus, it is a beacon for grace for any household that displays a parol. MiMac: I agree that the “San Fernando” lantern is beautiful in its own right. Even the ersatz plastic-wrapped parol exudes a quaint, although pedestrian, charm. You are welcome to join the “seminar” if and when we get around to organizing it. psychomom: Yes, we are considering video-recording of the parol-making exercise, for the sake of posterity perhaps. Disclaimer lang po: this is all for fun. A serious documentary must feature the real masters of the art — those who make a living out of it. betty q: in fairness to your generous friend, the package came from him. I am beginning to suspect that there are many other dinosaurs still lurking around, hehe…. I enjoy reading your mouth-watering posts, your frequent travels, also the thought that I am reading about someone who has made it in the world, yet remains very rooted in being Filipino. More power! natie: welcome to Jurassic Park! Hi MiMac, Cousin? based on your post above, yes? Hope you are feeling better now MM. We miss your posts! Mind posting some Christmas Party pics? Papa Ethan: Still laughing over “Welcome to Jurassic Park”… dinosaurs making parols! Gej: Laughed out loud over “Dinosaurs are a girl’s best friend”. I can relate too about togetherness while apart; this year will be another Christmas without Papa. It’s never the same, actually, even if I did make a papel de japon parol (will email you pala. VERY interested in learning to make one from scratch). I love these old fashioned parols. But, MM, I cannot wait to see this year’s Gingerbread creation. When is the “reveal”? Hi MM, is the global Christmas exchange gift on? Papa Ethan, I already emailed Gej. Gej, I hope my message won’t go to your spam folder. Off topic MM, Kristine, do you mind letting me know your email add so I can contact you when I return to Manila? Private e-mail to those who send messages of interest. MP, yes I got it (if that different user name was you). I can hardly wait to move back home to Manila and experience great stuff like these stars!!!! the dinorsaur comment reverberated as i recently got an email regarding old TV SHOWS, and i was able to remember rat patrol, combat, wonder woman!!! and the list went on and on…. hehehe. Nobody makes those traditional Japanese paper parols anymore. We still have the old parol made from Japanese paper from 25 Christmases ago and it still looks good. All I see is the weather proof, plastic kinds or the metallic foil types, while nice, don’t give you that nostalgic feeling. My mom say’s “Eh kasi naman dati hindi naman bumabagyo pag December kaya de papel and cellophane mga parol”. Haha. this may be a little late, but hey, Christmas happens every year. I’m still using the bamboo frames from parols I made more than 10 years ago. Really made them from scratch since I got the bamboo from the flower stands I took home from a funeral (hehe). Anyway, I used to make them with papel de hapon. I learned how to make them during my elementary days. After Christmas, I would just take out the paper and keep the frames for next year. After a couple of years, it became too tedious (12 lanterns) so I fell into the trap of using plastic. This year I saw some papel-de-hapon parols in las pinas and i realized how much more “christmassy” they looked. So next year, its back to papel de hapon for me. For those who do not have time ti make them, there’s one store in las pinas near the bamboo organ church that still makes them. You can order them in advance. They are open, I think as early as mid November. Do We Invent Some of the World’s Stupidest Rules, Or What?